STAR WARS BATTLEFRONT – ORIGIN this product is a digital code, once bought, the code will be sent to your email or can be downloaded directly from your screen. These codes are original and produced by Origin. These codes have no expiry date. In Star Wars Battlefront an entire fleet of X-wings and TIE fighters has expanded over the sky. Jump on the Imperial speeder bike and try to dodge the blaster fires coming your way. Engage in the whole new, legendary Star Wars battles. Be the hero; create your own unforgettable moments in Star Wars Battlefront. 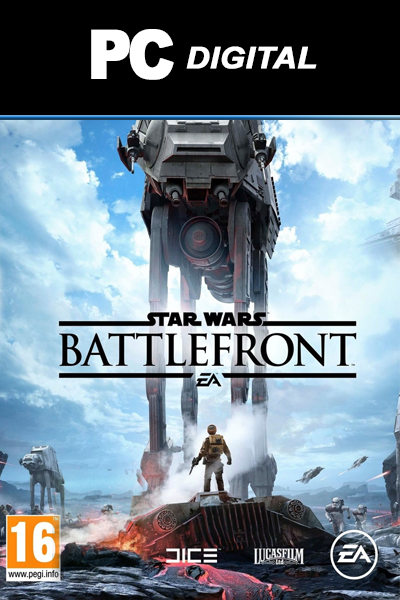 STAR WARS BATTLEFRONT - ORIGIN– is available right here at livecards.eu for the best price. The standard price for STAR WARS BATTLEFRONT - ORIGIN– will vary depending which store you purchase it from. Our STAR WARS BATTLEFRONT - ORIGIN– codes are 100% legit (you can check our FAQs) and some of the Cheapest STAR WARS BATTLEFRONT - ORIGIN– codes available in the market. Our prices are low because we buy in bulk allowing us to offer discounted STAR WARS BATTLEFRONT - ORIGIN– codes. Have you ever longed for joining the Dark Side of the Force? It’s within your reach now! Become Darth Vader to Force Choke your enemies or Emperor Palpatine to wield control over the galaxy. You may also dominate the battlefield as Luke Skywalker or aid your army with the Enhanced Squad Shield with Princess Leia. Take part in 9 different modes featuring from 8 to 40 players. Support or stop the AT-ATs assault. Dominate the sky in Fighter squadron mode or take a blast in the traditional team deathmatch. Fight for supremacy over five key points or defeat the hero. Team up to secure the valuable cargo boxes in ‘capture the flag’ mode at all costs. The battles have been taken to a whole different level of excitement. What makes them unique are the sound effects and replicas that reflect 100% of the Star Wars universe authenticity. How to buy Star Wars: Battlefront PC? Buying Star Wars: Battlefront PC from Livecards.eu is as easy as 1 2 3! Simply fill in your email address, select a payment method and complete the payment! We have some of the cheapest Star Wars: Battlefront PC on the market. STAR WARS: BATTLEFRONT - SEASON PASS PC DLC is available right here at livecards.eu for the best price. The standard price for STAR WARS: BATTLEFRONT - SEASON PASS PC DLC will vary depending which store you purchase it from. Our STAR WARS: BATTLEFRONT - SEASON PASS PC DLC codes are 100% legit (you can check our FAQs) and some of the Cheapest STAR WARS: BATTLEFRONT - SEASON PASS PC DLC codes available in the market. Our prices are low because we buy in bulk allowing us to offer discounted STAR WARS: BATTLEFRONT - SEASON PASS PC DLC codes.